For fantastic savings on stunning granite sinks, shop at HC Supplies. Purchase designer granite sinks that have been embedded with quartz crystal at their surfaces to ensure your chosen sink is exceptionally strong and durable. Create an elegant ambience in your new kitchen, or enhance the style of your current granite worktops with one of our beautiful granite sinks. Dare to be different with one of the many contemporary granite sinks offered by high end designers such as Astracast, Bretton Park, Rangemaster, and Schock. Replace your old sink with one of our low cost granite sinks today. Check the measurements of each granite kitchen sink, by clicking on the individual item. Save hundreds of pounds in our sinks for granite worktops sale. Our customers have varied tastes, which is why we provide an outstanding selection of sinks for granite worktops in an assortment of styles and colours. We stock classic white granite sinks, metallic bowls, cream models, and graphite sinks. Each style promises to be extremely durable to cope with the everyday activities of the modern household. Take a closer look at the entire range of sinks for granite worktops and decide which stunning model you simply must have to enhance your kitchen. HC Supplies prioritise customer satisfaction and delivering goods on time is extremely important to us.When you order our products you can expect them to arrive to your UK address within 2 to 7 working days.If you are ordering goods to be delivered abroad, it may take a little longer, but you can discuss your precise needs with our friendly customer services team. HC Supplies can deliver to Europe and even futher afield using reputable delivery drivers who will ensure your sinks arrive in pristine condition. If you need any further information about our products, or you need help deciding which sink is best for your kitchen, let us know via the online form, or give us a call. Our teams are here to help in any way they can and are able to give advice regaridng what size and model sink would best suit your needs. Would you like to see our quality sinks up close before you buy? 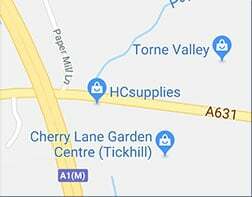 Why not visit HC Supplies at our showroom in Doncaster and peruse the range in person? We provide a large parking area just outside the MJM Bathroom showrooms, and if you need any assistance, or would like to enquire about access, please get in touch.